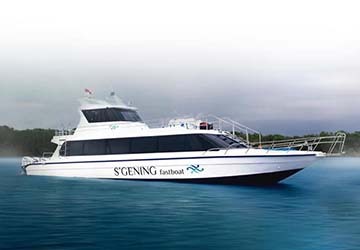 S’gening Fast Boat provide high speed ferry crossings from Sanur Beach in south Bali to Nusa Penida on Penida Island, east of the Bali coastline. The company provide two crossings a day each way, meaning you can spend a few days at each destination or just go for a day trip to enjoy the stunning sea vistas, beautiful beaches and tropical climate. The journey between the two picturesque port destinations takes just 30 minutes to complete. The port in Sanur beach is near the popular Denpasar whilst Nusa Penida is on an isle known as Paradise Island. The fast boat fleet consists of a new state of the art ship with a comfortable cabin area, the latest safety equipment and powerful engines. You’ll also be in the hands of a highly qualified and professional crew whilst on board. Directferries.co.uk allows you to compare S'gening Fast Boat timetables and fares with all alternative ferry operators before deciding on the best option for your trip.